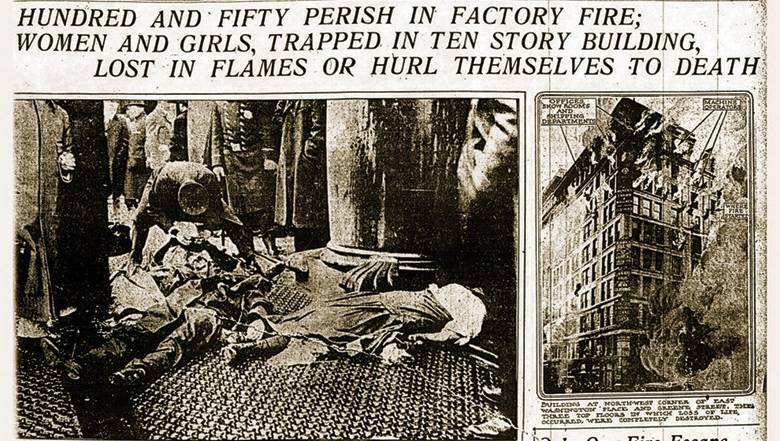 On Saturday, March 25, 1911, a fire broke out in the Triangle Shirtwaist Company’s factory in Manhattan’s Greenwich Village. There was something profoundly moving about the sight of the old man and the woman by his side, standing together in silence at the corner of Washington Place and Greene Street in Manhattan. The setting carries memories that shake to the core anyone who is familiar with the details of the Triangle Shirtwaist Factory fire that, on March 25th 1911, killed 146 workers, mostly Italian and Jewish immigrant women and girls. The fire, which was the result of unsafe working conditions, started at 4:40 on a Saturday afternoon of a beautiful spring day on the eighth floor, and spread within minutes to the other two floors of the factory, the ninth and tenth. Many were able to escape thanks to the valorous elevator operators, Joseph Zito and Gaspar Mortillalo, who went up and down, trying to rescue as many workers as they could. Others escaped through the roof, including the factory owners, who happened to be there that day. The ninth-floor workers were never warned. By the time they became aware of the fire, it was too late. One exit was blocked by the flames. Another by doors kept locked by the owners who made sure the workers’ bags were checked at the end of the work day, lest they stole a shirt or some fabric. There was no way out. Some fifty workers jumped out the windows, their bodies smashing against the pavement below. The powerless crowd watched in horror. In half an hour it was all over. They were young, these women and girls. The oldest was 43. They were as young as 14, like Rosaria Maltese, the aunt of the man I see standing today at the southeast corner of what was once called the Asch Building (now Brown Building), where the factory was housed. This man keeps alive the memory of Rosaria, the aunt he never met, her sister Lucia (20), and their mother--his grandmother--Catherine (39), who also died in the fire. He participates in the yearly commemorations. He brings flowers. “Once,” he says, “we brought 146 flowers”—a flower for every person who died in the worst industrial accident in the history of New York, The Triangle Fire is recognized by historians as a key event that changed public opinion concerning government intervention in labor regulations and triggered important legislation in its aftermath. 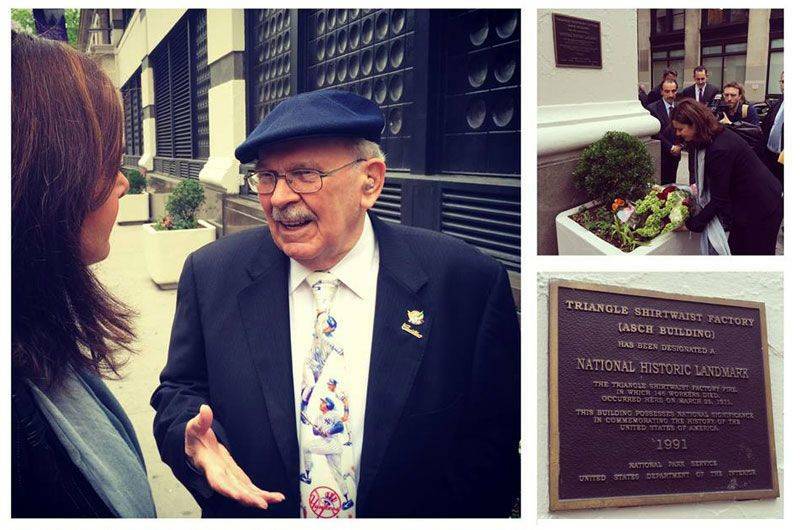 The man stands right in front of two of the commemorative plaques on Washington Place (a third is on Greene Street). But today is not March 25. Today is May 22, 2014. It’s not an anniversary. There is another reason for this commemorative moment that has brought some thirty people to the Triangle site. The reason is the woman who, visibly moved, is standing by Mr. Maltese. She is Laura Boldrini, since 2013 President of the Italian Chamber of Deputies, on an official visit to Washington and New York. She has insisted on finding the time during her packed schedule to pay tribute to the memory of the victims of the Triangle Shirtwaist Factory fire. When she arrives at the site, she shakes hands with everyone who is so eager to meet her. Then she turns her attention to Mr. Maltese, holds his hands in hers and talks warmly to him. The Consul General of New York, Natalia Quintavalle, and the Deputy Consul, Roberto Frangione, as well as members of the President’s staff and Italian reporters, accompany the President during this afternoon’s visit to the Triangle. Italy has come to remember the Triangle fire. Bob Lazar, former director of the Archive of the International Ladies Garments’ Workers’ Union, is also at the site, as are representatives of NYU. After leaving flowers by the commemorative plaques, President Boldrini and everyone else walk to the Labor Archive, a couple of blocks away, led by Timothy Naftali, the Director of New York University’s Tamiment Library and Robert F. Wagner Labor Archive and the President’s host on this part of her visit. After a brief stop at the Verdi exhibit in the lobby, we take the elevator up to the tenth-floor labor history archives, where Erika Gottfried, Curator of Nonprint Collections, dons thin white gloves before handling the archival documents she is about to show the President: photographs, newspapers, a striking collection of caricatures of leftist activists from the early twentieth century. Here, in this room, Mr. Maltese gingerly takes out of a soft leather briefcase mementos of the three women in his family and of the fire. 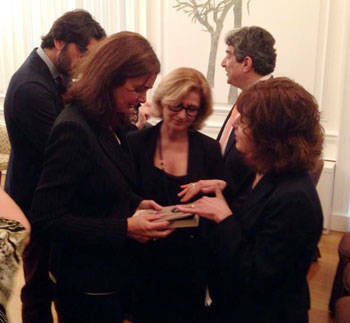 He shows them to President Boldrini, who receives them attentively and gratefully accepts those he has brought for her. Here, I have an opportunity to talk with the President of the Fire, its personal significance for someone who, like me, came of age in the late seventies and marched on the streets of Catania, where I was then studying at the university, clamoring for women’s rights and tacitly acknowledging the sisterhood that tied us to the women who had died in a fire that had occurred in New York some sixty-five years earlier. I did not know much about the fire then—not the name of the factory, not the date (we thought it had occurred on March 8 and that International Woman’s Day had been established to commemorate it), not the kind of factory, and certainly not that many of these women were Italian, many Sicilian, like me. In a few years, I would move to the United States and become a literary scholar, and my feminism would become dormant for a while. When it would awaken through my work about, and with, Italian American women authors, the memory of the Triangle Fire that we carried in our hearts as we marched on the streets of Catania would return. I would learn about its details. I would learn about its protagonists. In 2001, with the support of Stefano Albertini, Director of Casa Italiana Zerilli-Marimò, who generously opened the doors of his Casa to cultural events that dignified and represented the Italian American experience as a complex and nuanced cultural and historical phenomenon, the Collective of Italian American Women organized a ninetieth anniversary of the Triangle Fire. That event, and the conversations surrounding it, spurred a growing and pervasive awareness of the Fire as a key event in Italian American history. I remember talking about the Fire in Italy that year, with college students and Italian colleagues, with Maria Rosa Cutrufelli, and with Bruna Miorelli at Radio Popolare. I felt the tremendous power that the Fire possessed as a historical event that connected Italians across the ocean. I wanted to bring its memory back to Italy as part of a shared history. This year, in 2014, the first Italian book (Camicette bianche di Ester Rizzo) on the Fire has finally been published in Italy and there is even a movement there to name streets after the victims. Something that has been stirring for a long time is coming to fruition. During this official visit to Washington and New York, President Boldrini has met with Italians who have come here to pursue career aspirations that could not be realized in Italy. This is an experience that touches my family doubly. Both my sister Claudia and I have moved to the United States. We studied here and found the careers that we wanted. We got married, had children. We made lives in this country, which is now our country, but we are also Italian. And while history and economics separate us from the women and the girls of the Triangle Shirtwaist Factory—so many newly-arrived immigrants—there is a profound bond that pulls us together. Italian and Italian American. Back and forth. In between. One foot here and the other there. It’s our story, our history. After the visit to the Triangle site and the archives, President Boldrini addresses an audience at the Consulate and speaks of the pride that she feels meeting all these Italians who have found professional success in the United States. I cervelli in fuga. She feels pride, she says, but also anger, because a country that forces its children to leave is poorer for it. She wants to change that trajectory. She wants to be a bridge. Her words strike a chord. There is nothing tired or rehearsed about her speech, which is political in the best sense of the word. I feel, for the first time in years, truly represented by an Italian politician. And I return to that stirring image: a major Italian political leader standing together with a descendant of Italian immigrants from over a century ago, sharing the work of mourning and remembering, as Italian and Italian American. Yes, I feel the possibility—the reality of a bridge.